Are Movie Audiences Are Getting Dumber? 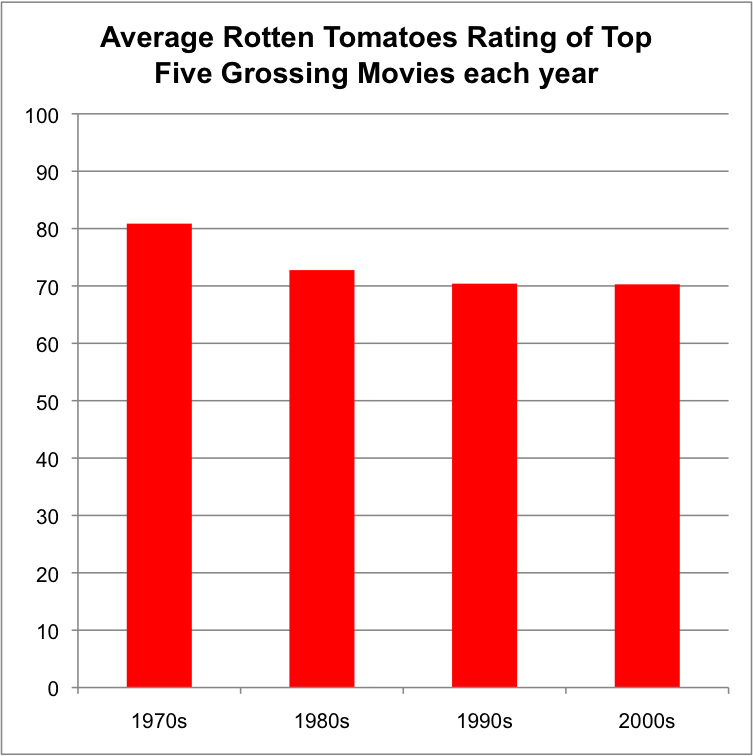 What I’ve done is found the Rotten Tomatoes score for each of the top five grossing films each year, and worked out the average across the ten years of each decade. The assumption I’ve made here is that the higher the rating on Rotten Tomatoes the ‘smarter’ that movie is. Therefore if the average RT rating for a decade is high, that would indicate movie audiences have opted for smarter movies in that period. Of course smart people can see dumb movies and vice-versa. However, surely one has to question the collective intelligence of movie audiences who continually go and see ‘dumb’ movies? What you can see is, contrary to my previous conclusions, movie audiences are dumber than in the 1970s. However, (and this is really important), that statement would have been just as true in the 1980s as it is today. It would be just as true to say (using the measure of RT scores), between 1980 and 2010, movie audiences’ intelligence has remained broadly the same. This is the classic chicken and the egg question. At its heart is whether studios respond to audiences’ tastes, or whether audiences respond to the whims of Hollywood producers. It is my opinion that the movies I have looked at are broadly representative of the decade as a whole, i.e. the 1970s were a golden era for Hollywood and the other decades were not. Why this was the case is harder to answer. Was it the talent of the directors at the time, the willingness of studios to give them a chance, or the political situation at the time making giving film a unique platform to comment on events? Probably a mixture of all three and lots more besides. All we can conclusively say is that if you want to watch a good American movie with broad appeal then you’re less likely go wrong with one from the 1970s. Are Movie Audiences Getting More Childish? The second thing I’d like to look at in this post is ‘childishness’. By ‘childishness’ I am referring to two things. The first is my hypothesis that less “R-Rated” (or movies for adults) are reaching the Top Five Highest Grossing Movies each year. The second is that movie audiences are opting for a ‘safe’ choice of a sequel rather than a more challenging original movie. I am perhaps stretching the definition of childishness here a little, but no doubt your four-year old self used to have a favourite movie you watched again and again and again, to the exclusion of all others. So, I infer, it is nowadays, when we watch the latest Shrek, Pirates, or Transformers movie are we not channelling our four-year old self by indulging these same conservative instincts? What we can see first-off is that the answer to our first question is that there are definitely less popular R-Rated movies than ever before. However, again we must consider the possibility this is down to studios, rather than audience tastes. Inception (like The Matrix) probably would have been an R-Rated movie if it were made fifteen years ago. Likewise the latest in the Terminator or Alien franchises. However, the fact that they’re not tells us that studios are removing adult content in the hope of reaching as wide an audiences as possible, and hence grossing as much money as possible. It is also very important that markets like China will not let R-Rated movies be shown. So unless a studio wants to lose a significant percentage of its profits, they must self-censor their own work. In terms of sequels, the evidence is a little less compelling, but still fairly conclusive. 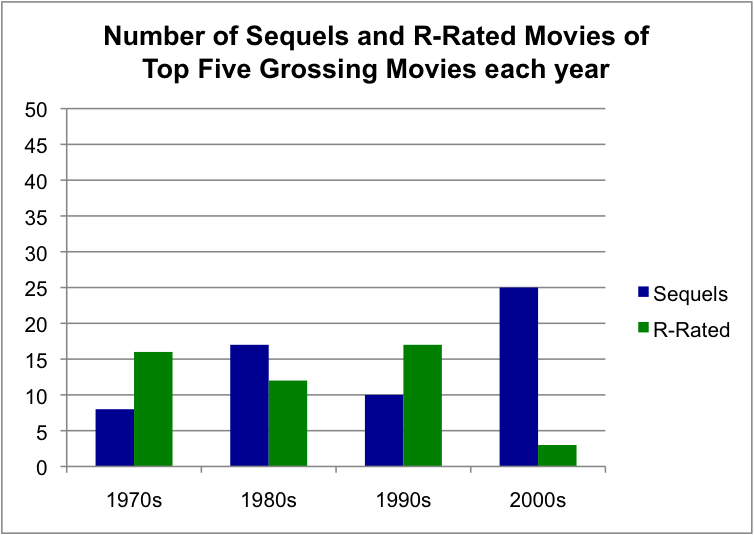 We can see that in the 1970s-1990s between 8 and 17 (or 16-34%) of movies were sequels. In the 2000s? 50%. Also, in the past three years, 2010-2012, it stands at 87%. In fairness to Hollywood, I put this more down to audience tastes, rather than studio’s cynicism. Part of the evidence for this can be seen this summer. Movies like Mosnters University, Fast and Furious 6, Grown Ups 2 and Despicable Me 2 have soared at the box office. Meanwhile original films like Pacific Rim, Another Earth and The Lone Ranger have floundered. If we look at the Top 10 highest grossing films worldwide of 2013 so far, we see only two (The Croods and World War Z) are original. Compare this to just twenty years ago, when 100% of the Top Ten films were original, and you can see how much the box office has changed. Here concludes the lesson. If you have any more questions or theories about the changes in popular tastes over the past forty years, please get in touch. I’ve managed to collect a good bit of statistical data in my research so far and I’m sure there’s loads more theories I could attempt to prove and disprove in the future. This entry was posted in 1970s, 1980s, 1990s, 2000s, 2010s, Box Office, movies, statistics and tagged Film, movies. Bookmark the permalink. Interesting post but perhaps you should also mention the rise of the blockbuster which is surely the single most influential factor in studio output and consequently, audience taste. When the 70s started the young Hollywood auteur-mavericks capitalised on a pre-blockbuster culture in Hollywood that facilitated their artistic brilliance and indulgence to an ever-escalating extent until Heaven’s Gate shattered the illusion. That, combined with the success of Star Wars and Jaws completely changed the paradigm for the studios so they moved further away from auteur-driven ‘art’ cinema to high concept driven spectaculars with more producer involvement and less directorial autonomy. The 70s was the last period of great American cinema and the seriousness and artistic vision of those directors delivered serious, adult films – The Godfather and Godfather II, Badlands, Apocalypse Now, The Deerhunter, Taxi Driver, Coming Home, Deliverance, Reds, One Flew Over The Cuckoo’s Nest, Chinatown, Network, Klute, The Parallax View, All The President’s Men, Midnight Cowboy, Five Easy Pieces, The Exorcist, The French Connection and many more. I question whether these films would fall under the ‘broad appeal’ category you mentioned but I take your point. For good American product today look to HBO and other networks pushing the creative envelope in areas of writing and acting. Adult and fearless. Good American films are still being made but as you pointed out, the studio system wants to dumb everything down to maximise returns. Who knows where it’s all going to end up. One of the conclusions I’m drawn to in doing this research is that the period at the end of the 1960s and into the 1970s was an exceptional time in American popular cinema. If you go back to 1965 and before, the most popular movies were Disney Animations (e.g. 101 Dalmatians and Sword in the Stone), Musicals (e.g. Sound of Music, West Side Story, My Fair Lady) or Big Budget Epics (e.g. The Ten Commandments and Ben Hur). None of the examples given here are badly made films by any means, but at the same time none of them pushed the medium of film into new and interesting places. The late 60s and 70s are exceptional in that it is the only recent time some of the best movies of the time were being made in Hollywood and watched by a large number of cinema-goers. If one were to write about the history of the medium of film (the most important films creatively), and the history of the film industry (the best-performing film financially) it is probably the only period since 1930 where there would be an almost identical chapter on each. Compare this to more recent times and directors like the Coens, Cronenberg, Lynch, Tarantino, Van Sant and PT Anderson would all feature when looking at the medium of film, despite having very limited impact on the industry in financial terms. I like the distinction you make between the medium and the industry and the directors you cite reinforce the point very clearly. In spite of their critical and sometime commercial success they are all very much ‘indie’ directors. Aronofsky, Payne, Soderbergh, Russell and even Clooney (!) could arguably be added to that list. But who puts bums on seats? Michael Bay? Gore Verbinski? Joss Whedon? JJ Abrams? They’re making big, flashy entertainments but would you sign up for their entire ouevre? It’s MacMovies – initially appealing, very tasty for a while but too much will eat away your very soul! It makes no sense to say that people are getting dumber since the education system has not changed a great deal since the 1970’s. Unless there is a chemical factor in the food or in the air that makes people dumber then it’s more than safe to say that people are just as dumb now then they were in the 1970’s. I think that it’s far more likely to be a cultural thing than otherwise. The advent of video games where absolutely everything and anything can happen regardless of whether it makes sense logically is one of the reasons why, I think, audiences these days don’t care much whether a movie makes sense or not. As long as it’s entertaining then it’s good. Extraordinarily dumb movies like all the transformers movies as well as the twilight movies and countless others prove my point. Also I am in my 50s and so I was around in the 1970’s and I can tell you withy absolute certainty that movies in that era were much better than they are now. I attribute that to the fact that because of the lack of ability to produce good special effects the movie studios had no choice really but to try to make sure that movies had good stories and good characters. People in Hollywood (and elsewhere where they make movies) are not stupid. They have seen those trends and are trying to make movies that are adapted accordingly. Also with all this home theatre revolution they are struggling to survive and when you are trying to survive then sequels are safer. There is a lot more to it than what I just said but I did not base my assessment on a senseless premise which asked whether people are dumber now than before. I agree with a lot of your points. On the issue of people getting dumber, you’re right, I guess it would be more accurate to say the question we can really address is “Are Audiences Movie Tastes’ Getting Dumber?” (or less sophisticated). However, I’m not sure I would say studios are “struggling to survive”. Yes, there are flops, but every year there seems to be more and more big-budget blockbusters than the last. Until we can definitively see a drop in these types of films I am reluctant to believe the big studios are really struggling as much as they say they are. This reflects my experience in the film industry and film school. On the last day of class in cinematography, my teacher brought into class a few films he was sent to judge for the academy Awards. Departed, Babel, Children of Men, Last King Of Scotland, Prestige, Little miss Sunshine, and Happy Feet. We took a vote for which to watch. Every single student, but me, choose Happy Feet. After 10 minutes of viewing this childish plagiarist garbage, I had to leave, and similarly I had to leave the business because there is hardly anyone in it who values knowledge or art. In the classes where we talked film theory and production visualization none of the students got it at all, explaining to them that you make art in making choices based on cultural analogies and set symbolisms was like talking to elementary students about quantum physics. These students are the industry today. Our country no doubt has been systematical stupefied. I left college with the understanding that school is affirmative action for stupid people. It’s like Bukowski says if you have to try don’t. Trying that hard means you are no good at it. Now that the film industry is no longer an art form, but more like an assembly line production where the machines do all the work, people with artistic sensibilities are going elsewhere. This is why films are getting bigger and making more money, it’s a growing dumb minority making movies for a growing dumb majority, that’s economics. All they care about is getting you in the theater that opening week and the product greatly reflects that. The guy claiming we are just like the 70’s BS. School today is nothing like the 70’s, it used to be about long term memory, now it’s cram it all in short term, test them before it slips, pretend we are doing a better job. And with computers we see less and less hands on, my friends in art school don’t even use pencils, inks, and brushes anymore, it’s all on a screen. That is how you get dumber, letting media and machines replace experience.